A woman fought back tears as she finally saw a famous painting she featured in as a child 63 years ago. 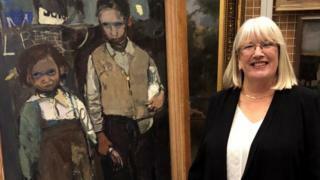 Joan Eardley painted Margaret Livingstone and her older brother Alan in Glasgow in her 1955 work "Brother and Sister". Margaret was taken into care shortly after the painting, and lost contact with her family for many years. She later heard about the painting from her brother, and came face-to-face with the "gorgeous" work in Aberdeen. In the painting, Alan has a protective arm around Margaret. She first heard about it when, with the help of the Salvation Army, she met her mother and brothers in Swindon in 1985, having last seen them in Glasgow at the age of 13. An emotional Mrs Livingstone - who now lives in Essex - said as she was introduced to Brother and Sister at the Aberdeen Treasure Hub: "Oh wow, it's gorgeous isn't it? It's beautiful, I love it. "Alan would have been so happy to see this. "I don't remember much about her (the artist) and I wish I did, I wish I knew what she was thinking, I wish she was here to ask. "I am so pleased to have been able to see it." The late Joan Eardley was regarded as one of the UK's greatest post-war artists. She trained at Glasgow School of Art and her career featured Glasgow and the coastal village of Catterline in Aberdeenshire.